Lazy Seamstress: Busy Busy Busy ! Pin Board, originally uploaded by indiaeden. It's not nesting ! It's simply making the most of Woody being home and getting on with all those pesky jobs around the house. I have a list taped to the fridge and am crossing things off with great satisfaction as I go. Just having a tea and much needed chocolate break. This is a pin board I whipped up for India's room, which I decorated a while ago now, but has only been tidy enough for me to actually open the door and hang this board for about 30 minutes ever since. I hung the bunting I made too. Now it's back to painting Eden's room, the tiniest room in the house and it's taking far longer than anticipated painting pale green over dark crazy coloured walls. Just quickly want to say thank you so much to you all for the comments left on my last couple of posts, knowing you are all willing me and baby boy on is a great comfort. I can't promise my posts here are going to be terribly sane over the coming weeks, but I'm trying. oo the cherry pin board is sooo pretty! Beautiful!!! 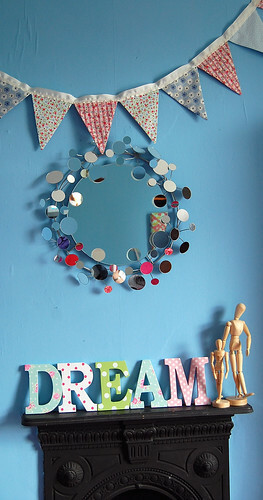 And I love that mirror, can you share where you found it?? Leigh the mirror came from a high street store here in the UK called Dunelm Mill. and who needs sanity. Bearing children, even when everything goes to plan, is an awesome and terrifying time - let alone having the history you have. The only certainty is that this tine will be different. I can't guarantee a happy ending but it will not be the same as it was with Florence because you are a different person now- because of her - and this is a different baby. The certainty is that you love Florence and you love this baby. And that you are loved. So bring on the insanity and live it to the full as that's the reality of where you're at. Busy, busy , busy indeed! You should consider interior design one day - what you do always looks so classical, timeless and yet on trend. Love the pin board, Ive had the materials in place to make DD2 & DD3 theirs for too long now...your pics are just the poke I needed. How did you make the board? I made one for Lou but had no clue where to start. 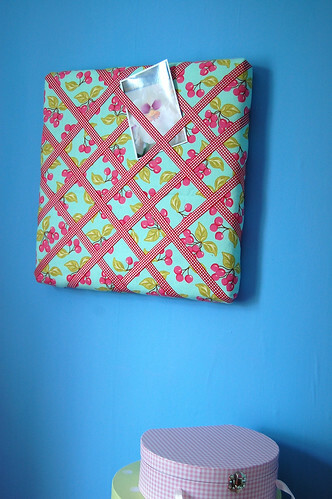 I padded and covered a cork board that was hanging around in the basement. You make such pretty things, in awe of what you do with your hands. What is sane anyway, listening as you process these thoughts about your Florence and your baby boy.